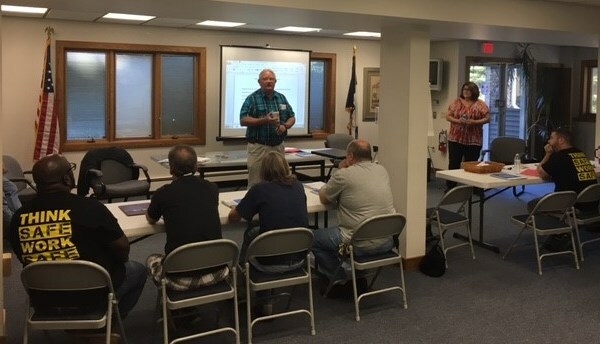 The IAM’s Eastern Territory recently conducted its first field program for the popular Winpisinger Center class, Negotiations Prep, for two Connecticut Locals. In two days, the District 26 negotiating committees were able to draft their ground rules, design and produce their Strategic Plan, and become a solid committee. This class was the result of Local 1137 President Paul Pecorelli and Local 1137 Vice President Mike Calienedo, who heard International President Bob Martinez speak about the program at the Connecticut State Council of Machinist’s summer meeting. They were extremely interested in the class and how it could work for them. So District 26 Directing Business Representative Everett Corey began working on dates with Education Representative Donna Perinetti and Special Representative Doug Sizemore. The two committees negotiate at the same time—Local 1137 with lock manufacturer Assa Abloy and Local 1249 with door hardware-maker Corbin Russwin. The new Field Negotiating Pre Program is not designed to replace the Winpisinger-based Negotiation Prep program, but will accommodate situations where in-the field negotiations preparation is the better option. Learn more about the Winpisinger Center’s new Field Negotiation Prep Program.